The Glass Castle meets The Nest in this stunning debut, an intimate family memoir that gracefully brings us behind the dappled beachfront vista of privilege, to reveal the inner lives of two wonderfully colorful, unforgettable families. On a mid-August weekend, two families assemble for a wedding at a rambling family mansion on the beach in East Hampton, in the last days of the area’s quietly refined country splendor, before traffic jams and high-end boutiques morphed the peaceful enclave into the "Hamptons." The weather is perfect, the tent is in place on the lawn. But as the festivities are readied, the father of the bride, and "pater familias" of the beachfront manse, suffers a massive stroke from alcohol withdrawal, and lies in a coma in the hospital in the next town. So begins Jeanne McCulloch’s vivid memoir of her wedding weekend in 1983 and its after effects on her family, and the family of the groom. In a society defined by appearance and protocol, the wedding goes on at the insistence of McCulloch’s theatrical mother. Instead of a planned honeymoon, wedding presents are stashed in the attic, arrangements are made for a funeral, and a team of lawyers arrive armed with papers for McCulloch and her siblings to sign. As McCulloch reveals, the repercussions from that weekend will ripple throughout her own family, and that of her in-law’s lives as they grapple with questions of loyalty, tradition, marital honor, hope, and loss. Five years later, her own brief marriage ended, she returns to East Hampton with her mother to divide the wedding presents that were never opened. 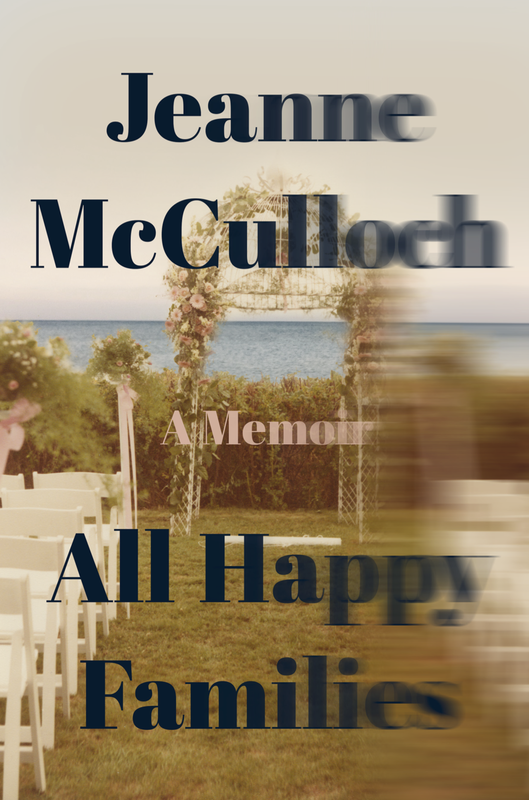 Impressionistic and lyrical, at turns both witty and poignant, All Happy Families is McCulloch’s clear-eyed account of her struggle to hear her own voice amid the noise of social mores and family dysfunction, in a world where all that glitters on the surface is not gold, and each unhappy family is ultimately unhappy in its own unique way. >>> Read more reviews and news for All Happy Families here.